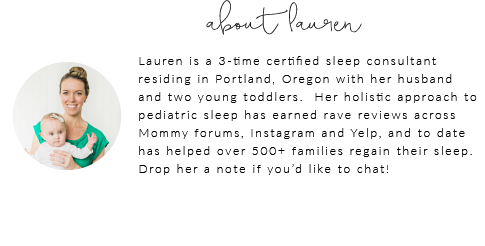 Sleep and the City was founded by Lauren after completing over 150+ hours of sleep work and helping numerous family members and friends with their infant and toddler's sleep issues. She is trained in numerous child sleep training methods (Sears Attachment, No-Cry, Ferber, Extinction, Happiest Baby, etc), although one is rarely needed due to the modern methodology used at Sleep and the City that minimizes tears (if any!). We view every client as an individual case- and all sleep solutions are based on your lifestyle, parenting style, and child’s temperament, keeping your sleep wishes in mind. At SATC we work very closely with a limited amount of clients at a time to ensure satisfaction and attention needed. With over five years of private baby sleep consulting, you will work directly with our founder to ensure your sleep goals are met through the best plan possible for your child. Mom of two extremely busy babes whom are 20 months apart! Do you ever collaborate or write guest blog articles for others? Absolutely! We love to collaborate and connect with small shops, large brands, bloggers, etc. on multiple levels- whether that’s through one of our quarterly photoshoots, a giveaway, affiliate program, discount codes or product exchange- we strive to provide and showcase the latest & greatest out there for our followers to enjoy! Shoot us an email and tell us your ideas! Blogging is our jam, and we’d love to contribute to your website via a Guest Post, whether it be one time or a monthly contribution! Email us at hello@sleepandthecity.com and tell us a little bit more about yourself and what you’re looking for! Do you hold public speaking events or small workshop groups? Currently, to give the best overall speaking experience, we are only booking speaking engagements for groups with up to 25 attendees only. (We love to spoil our attendees!) If you have a small storefront, Mama group, or parenting club that would be interested in booking our founder, please email us at hello@sleepandthecity to discuss our packages and your ideas! All media/press inquiries can be sent to hello@sleepandthecity.com and will be personally answered by our founder, Lauren Olson. Small workshops is something we are VERY excited to host in the near future, stay tuned and reach out if have some ideas or you’d like to talk about booking our founder for your event! I love your Instagram! Are you available for social media consultations or lifestyle/brand photography? Our passion is connecting with other Mamas & Dads around the world via social media, on Instagram in particular! Over the past year we’ve surged 400% in our follower base, with an average engagement rate that is double the current standard. Our photos are regularly top-ranking photos in the baby/child/family industry on Instagram. But where do you begin? And how do we make it happen on a daily basis? Hit us up, we’d love to chat! Social media consulting rates are billed hourly, and pro-rated. Photoshoots are a MUST to build your social media following and brand, we would absolutely love to chat with you about our lifestyle & brand photography packages and provide you with examples of our past work with some of the largest baby & child brands out there today! We currently specialize in photographing indoor with natural light, with a crisp yet airy feel. To see more examples of our work, email us at hello@sleepandthecity and we would be more than happy to provide you with some of our most recent work!